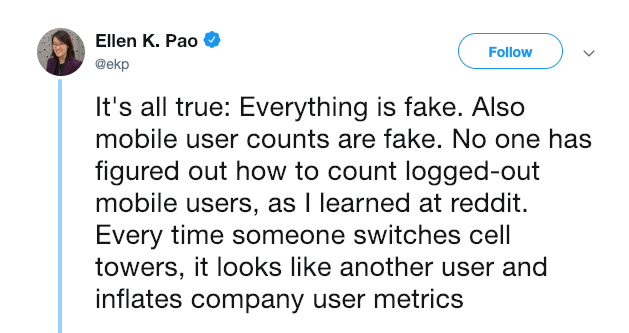 According to Ellen Pao (former CEO of Reddit, and investment partner at VC firm Kleiner Perkins) and others, a lot of internet stats we see reported are fake. It’s not just people making up stats – it’s that the stats themselves are often dodgy. “Studies generally suggest that, year after year, less than 60 percent of web traffic is human; some years, according to some researchers, a healthy majority of it is bot.” We live in an era of click farms and deliberate misreporting by major platforms to improve perception. You can buy 5,000 YouTube views — 30 seconds of a video counts as a view — for as little as $15. Do we have more leads today than we had last month? Did we close more sales this month than we did this time last year? Visits to your website, likes on your Instagram page, followers on Facebook are all nice, but at the end of the day, the only thing that is really measurable is revenue. It’s the only thing you can be certain of. The other metrics of digital marketing can be good indicators, and they can be ego-boosting, but we need to be careful about their legitimacy. Our advice is to focus on the fundamentals – which always begins with getting your marketing strategy right. Do you understand your customers? Is your value proposition superior to that of your competitors? Are you able to communicate it in a single sentence? Once we have those things nailed down, then we can think about how to reach potential customers via digital marketing – and the real stats, the leads, the sales, the revenue – will always follow.